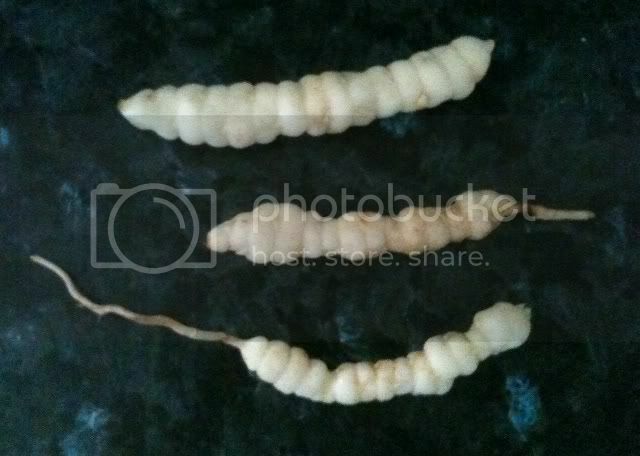 Would anyone know what these grub/fungus things are? Would anyone know what these are? Found them in the garden. 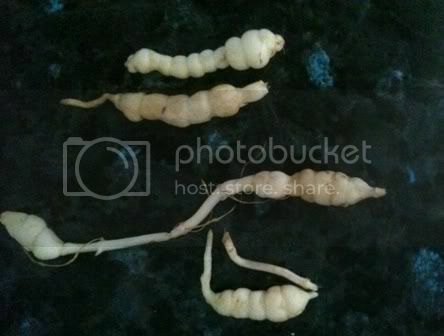 I don't know what they are but they look to me like tubers or rhizomes -- roots -- of a plant. ...or we're they moving when you first dug them out of the ground? It would help to know where you are located. Chinese artichokes? Please do not eat those until properly identified. I agree with Apple. A tuber of some kind. definitely a tuber/rhizome, i agree. nice! i can see why some think they're the same plant - they look almost identical. i had just been washing some of mine (S. affinis) for a get together last night when i first saw this thread. the ones i was washing were marginally fatter/lumpier than the original pic, but i admit to have cherry-picked them for optimal effect on guests. class B noxious weed in my state, too, apparently. S. floridana is the state-listed weed.